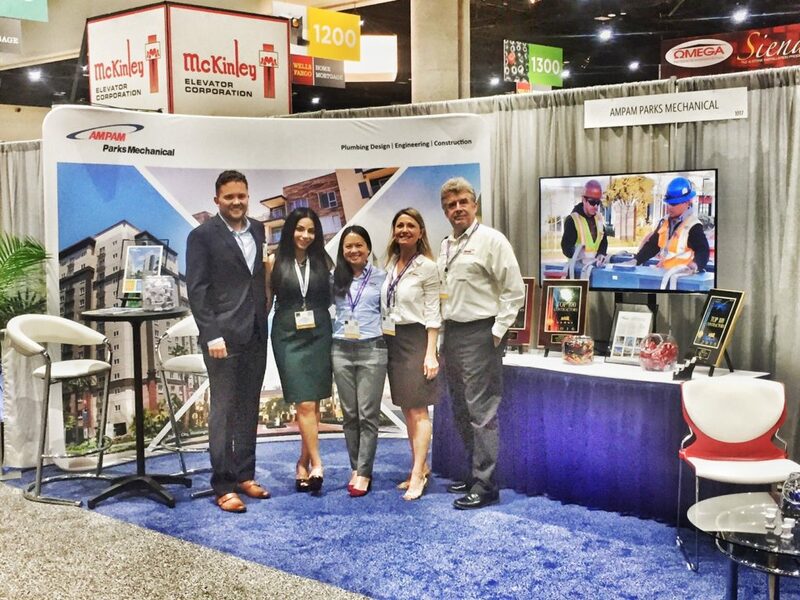 AMPAM Parks Mechanical brought the team from Southern California even further south to attend the PCBC Conference at the San Diego Convention Center June 27-30, 2017. PCBC offers high-level educational sessions, workshops, networking opportunities and a curated exhibit floor. The hundreds of exhibitors and thousands of attendees who come include businesses primarily in the homebuilding and manufacturing industries. The annual conference launched in 1959 as the Pacific Coast Builders Conference and includes members in 20 of the largest publicly and privately held homebuilders in the U.S. It is sponsored by the California Building Industry Association (CBIA). Drew DeFalle, Mahsa Ghalehshahi, Sochenda Sopann, Suzi Albrecht and Gary Fellhoelter in AMPAM’s booth at PCBC in San Diego.